AMATOLA FLY FISHING CLUB (Stutterheim & Kingwilliamstown). According to Ronald who lives at the bailiff’s house at Gubu Dam they have had plenty of rain. The water is still discoloured by the heavy rain and this problem is exacerbated by the fact that the dam is still only 85% full as they are still releasing water to Wigglesworth Dam. The wave action on the exposed areas also tends to cloudy the water. The last stocking of large fingerlings took place in late October 2018 and these are very evident at the moment as they have grown out to about 15 to 17cm. Normally the fishing at these two waters is still slow at this time of year as the water is too warm, but Gubu is very deep so one has to get one’s fly well down. Expect the fishing to pick up again towards the end of April as the water cools down. For Gubu contact Edward Truter at Edward.truter@gmail.com or 078 1141669 or alternatively Ryan Smith at 078 0199967. For Maden Dam it is Dean Stoltz of Target Line at 043 7265133 or go to the website at www.amatolaflyfishingclub.co.za. Most of the visitors to this picturesque venue are hikers but there is some interesting trout fishing as well. The Cata River contains wild browns, small in the forested upper reaches but larger in the bottom section. 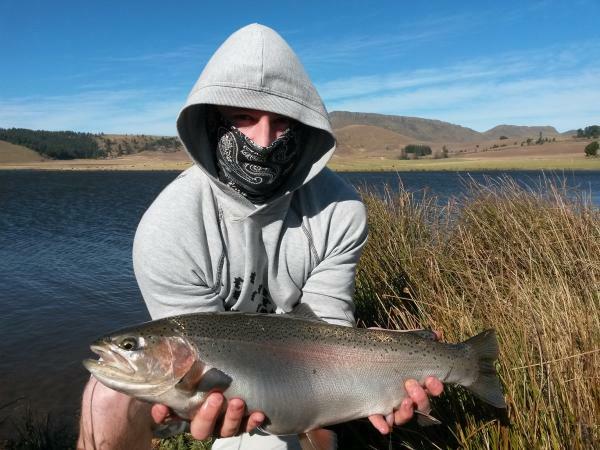 The nearby Mnyameni Dam contains plenty of pan sized wild rainbows so light tackle is required for angling. For more go to http://www.cata.org.za/fly-fishing/. Martin Davies reports that this water is looking really good as the dam is overflowing. However, nobody has fished it comprehensively since December when Martin and his brother took 8 fish. Since the severe drought two years ago which had a devastating effect on the population the dam has been restocked at least twice and a visit to this attractive water should be very rewarding now although it is recommended that a tube is required due to the airly heavy weed growth.